Win a family pass (2 adults & up to 5 kids) to the Huka Prawn Park, Taupo. COMMENTING with a family activity you hope to do over Easter. You can also TAG someone into the Facebook post (not mandatory but will earn you an extra entry). 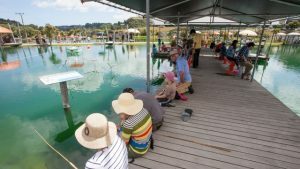 Like or follow ‘Kids On Board NZ’ and Huka Prawn Park on Facebook / Instagram to receive updates on other promotions and events for families, like the prawn fishing competition they have running throughout the April school holidays. For more information about Huka Prawn Park please look at the listing here or their own website here. Passes are valid until 9th March 2018. Age for the child passes is 5-15 years. Children under 5 are free. Kids on Board would like to thank Huka Prawn Park for their generous donation. The kids would love to experience prawn fishing given an opportunity like this..
We will be celebrating our youngest first easter. Ester hunt, trip to the pool and some quiet family time. Xo.. Nothing is better than family picnics and just throwing a ball about.